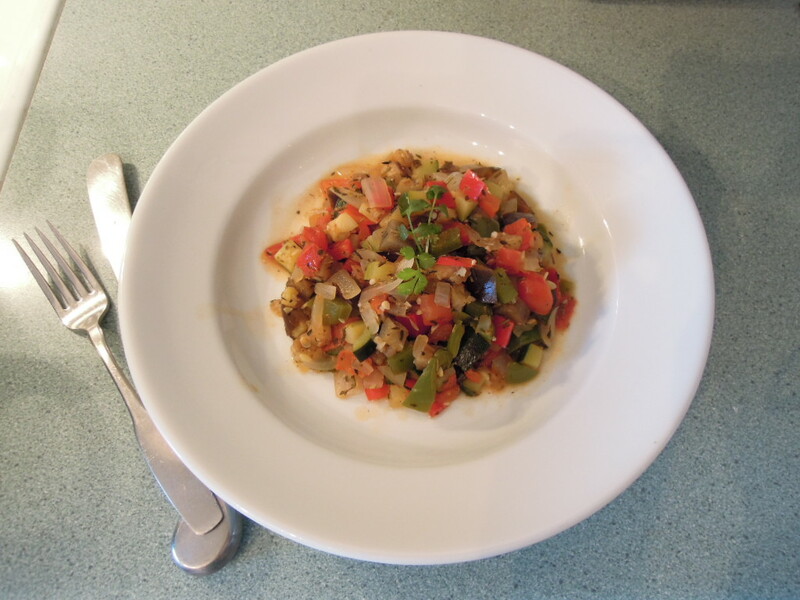 For my first recipe blog, I decided to go with a classic: la Ratatouille. A lot of you might know this delicious dish by watching the movie, but don’t worry, I didn’t hire rats as sous-chefs in my kitchen. Believe it or not, I tried making ratatouille for the first time only a few months ago. I have made plenty of “ragout” type dishes but never really followed the ratatouille recipe. It is a perfect summer dish, typical southern French, the flavors blossom together perfectly and you got to love any dish that has Herbes de Provence in it. Cut all the ingredients into little even cubes. The key term here being, even. I’m not gonna lie to you, if you make ratatouille for 6, you’re going to be chopping away for a while. But it’s really worth it. It helps to cook the vegetables evenly, and also makes the textures of the dish very agreeable in your mouth. Do not include the tomatoes’ seeds. It keeps your ratatouille from becoming a spaghetti sauce (also very good, but not the goal here). Finally, make sure you incorporate the ingredients in the right order while cooking. Some vegetables take longer to cook than others, so incorporating them first allows them to be fully cooked. Of course, there are tons of different recipes for ratatouille out there. You’re more than welcome to bring your own twist to the recipe. I happen to really like this recipe, it’s simple and delicious! Cut all vegetables evenly into small cubes. For the tomatoes, remove the seeds first (you can keep them to make a sauce for another dish the next day). Cover and let it cook for 20 min. Uncover to let it cook for another 3 min. Add some olive oil and serve. You can add some parsley on top to make it pretty! Yum! I love ratatouille. If you are ever wondering what to do with the leftovers I use them in a lasagna. Ratatouille makes the best lasagna ever! Great idea to use ratatouille leftovers for lasagna. I’ll make sure to remember that tip! Bon appetit. We have a great recipe for Ratatouille too -from the butcher in Menerbes. Love love love ratatouille! I agree. You can never go wrong with ratatouille! Thanks for stopping by. That looks delicious! Now I just have to find a sauce pan. What a lovely and simple recipe! Thanks, Lucie. I’ll have to try this tomorrow. One question: can I substitute zucchini for squash? Sure, zucchini is a summer squash so it stays in the same family! Enjoy.